Sophomore running back No. 3 Rhamondre Stevenson carrying the defensive line on his back and pushing through to gain yardage. 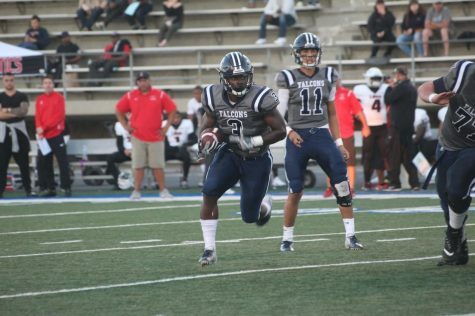 Stevenson set the Falcons' school record in single-game rushing yards with 339 in the game at Cerritos College against Long Beach City College on Sept. 29, 2018. 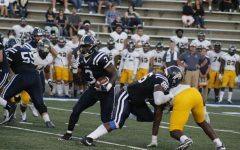 Cerritos College faced off against its long awaited rivals Long Beach City College on Sept. 29 in what turned out to be a loss of 32-46 for the team, but was also a record breaking game for sophomore running back No. 3 Rhamondre Stevenson. Stevenson had a record breaking night rushing for 339 yards and three touchdowns. He would break former-Falcon running back Jermaine Whiten’s 308 single game rushing yards record set back in 2002. 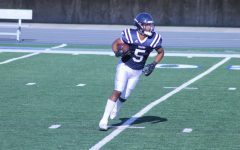 Sophomore running back No. 3 Rhamondre Stevenson rushing the ball in attempt to gain the first down for the Falcons. 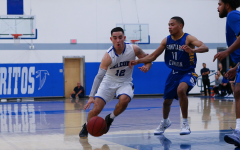 Cerritos College lost the match-up against Long Beach City College 32-46 on Sept. 29, 2018. 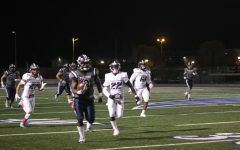 Through the first quarter, the Falcons went scoreless as the offense struggled early while Long Beach City went on the offensive and tacked on seven points on the quarter. The first quarter ended 7-0. In the second quarter, the Falcons first touchdown was on the first play of their fourth drive when Stevenson took it the distance for 70 yards to give the Falcons their first and only lead of the game 13-10. Later in the second quarter, the Falcons would cough up a turnover on offense giving the ball back to the Vikings, who scored again leading the Falcons 17-13 into halftime. 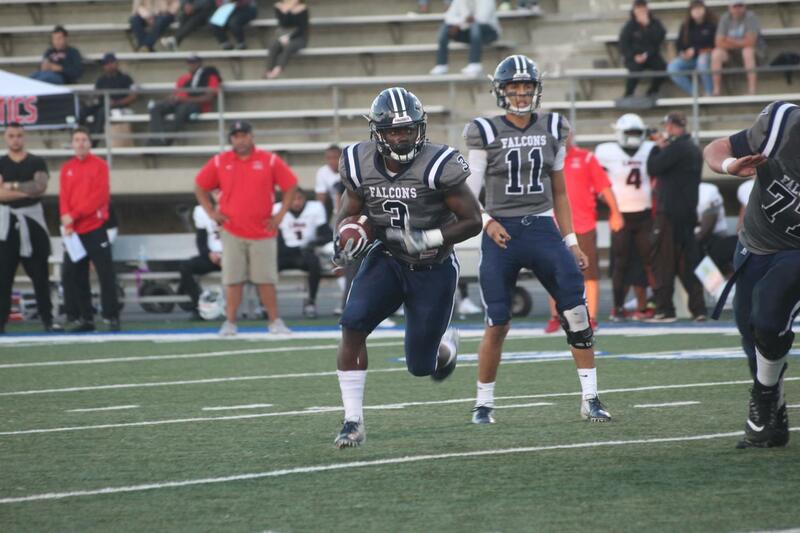 The Falcons would give up another turnover on the first play of the second half, which LBCC took advantage of. 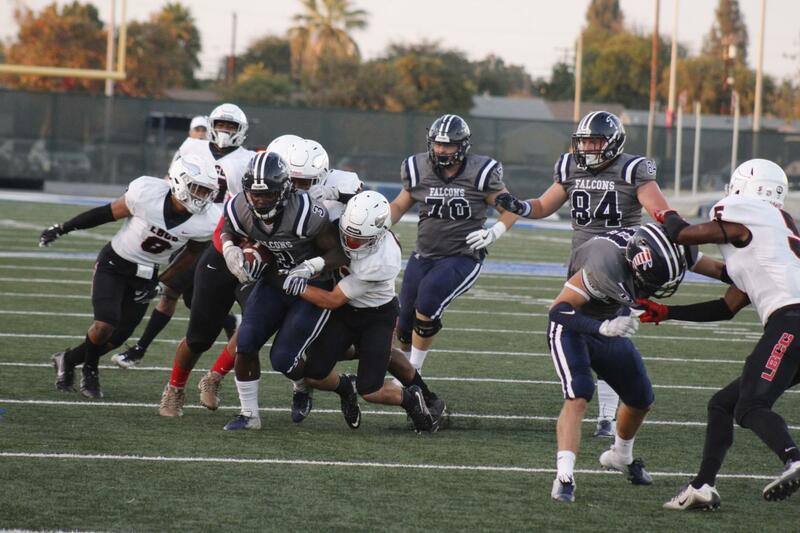 LBCC added 14 more points to their lead running away with a 31-13 score. However, the Falcons would strike again halfway through the third quarter where Stevenson would break multiple tackles to run for a huge 60 yard touchdown to keep the game close 19-31. Heading into the fourth, with a bunch of momentum off of Stevenson’s touchdown, Cerritos defense would stop the Vikings offense on the next drive to force them to punt. Unfortunately, Cerritos would cough up yet another turnover to give the ball right back to the Vikings. 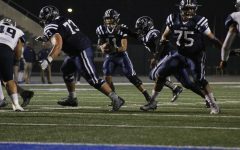 The defense for Cerritos would give up no points on the Vikings next offensive drive despite the turnover which kept Cerritos in the game. 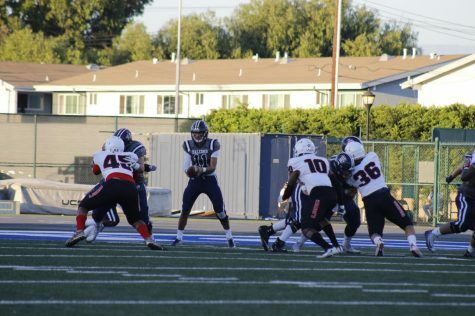 On the next Cerritos offensive drive, Stevenson would have reservations for six carrying the rock for a 90 yard touchdown. This run broke the single game rushing record. Cerritos was inching closer with the score now 25-31. 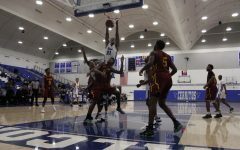 Cerritos defense would lose its momentum letting the Vikings score four minutes later, extending its lead 38-25. This wouldn’t stop Cerritos from scoring again when Bravo hit wide receiver No. 5 C.J. Parks parks on a slant route who muscled his way to the end zone. 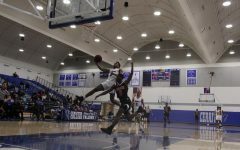 The score was now 32-38 with LBCC still leading. Cerritos attempted an onside kick at kickoff, but was unsuccessful giving great field starting position for the Vikings. Sophomore quarterback No. 11 Isaiah Bravo handing off the ball to one of his running backs to try and create a first down gain. Long Beach City would counter off Cerritos and score another touchdown to extend their lead 46-32. 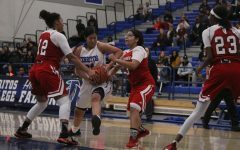 Cerritos kept on fighting to score as quickly as possible but would fail to do so as Long Beach City would hold on to win the game 46-32 and give Cerritos their second straight loss. 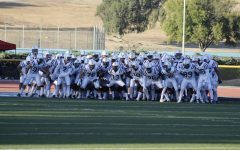 The Falcons will have a bye week and then will play at Fullerton college on Oct. 13 to play in their first conference match. 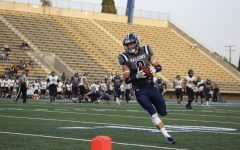 Fullerton college is facing heavy sanctions making them ineligible for playoffs Grosfeld added, “They have done some improper deals, so they can’t go to playoffs. They can’t win the conference, so we will go and play them tight. “I can say we are gonna go out there and beat them, but it’s a non-factor because they can’t go to the playoffs.” he said. “One of the best teams that we ever had here, I was fortunate enough to be on and were three and two just like how we are sitting here right now and we just rolled straight through and won eight straight games and this team can do that there is no question about it.” he said.